Two Sisters From The Right: They Hate Us, They Really, Really Hate Us. September 11, 2011 was a day of rememberance for Americans nationwide. Although the most prominent memorial events were held at Ground Zero, The Pentagon, and a field in Shanksville, PA, cities through out the nation held their own memorial services. Even the NFL had a very moving tribute to those who lost their lives as the result of that vile terrorist attack. Although we watched most of the programming on television for the last two days, we could not recall seeing any Muslim stand at a podium and denounce the events of that day ten years ago. After having written in last night's blog that it was difficult to tell who was a "good" Muslim and who was an Islamist extremists plotting killing and mayhem, we were more than a bit angered by Megyn Kelly's guest today on FOX. He was a retired military officer whose name we did not catch, but after speaking of the progress that had been made on the war on terror, he scolded Americans saying that the United States needs to stop the "fear mongering." When asked what he meant he said, "People have to stop seeing a terrorist under every prayer rug!" Once again some talking head is pointing an accusatory finger at Americans who are concerned about our country's safety. This reminded us of the Cold War era when folks were accused of "finding a communist under every bed." Our reluctance to welcome Muslims with opening arms is well founded. "Ugly Americans" who criticize, demean our country, our government and a great number of our citizens. Some of our least liked Ugly Americans are people like Michael Moore, Sean Penn, Rosie O'Donnell and Janeane Garofalo to name a few. When we have Americans who disrespect our country and our values, can we expect better from others? 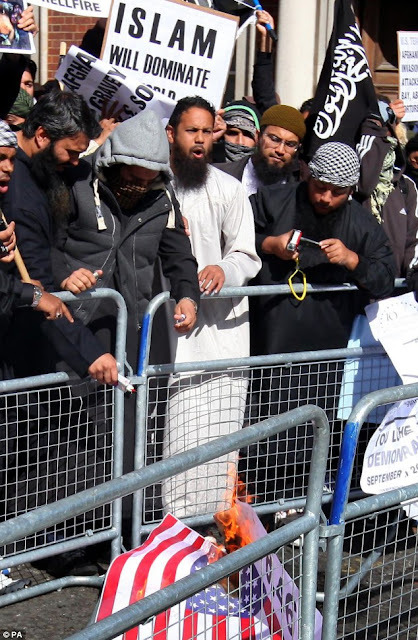 We'll stop looking for radical Islamist extremists, when Muslims can convince us that they can assimilate as Americans, adopt our customs and traditions, pledge allegiance to our flag, and publicly denounce those who were responsible for 9-11, and others who live only to destroy our Western ways, and our very lives. Until Muslims world wide can stop reviling America and begin treating us with the same respect they expect to be shown, there will not be a reconciliation, let alone peace. While we in the United States remembered and revered those who lost their lives on September 11, 2001, Muslims in other parts of the world reaffirmed our belief that we must remain vigilant, wary and distrustful. 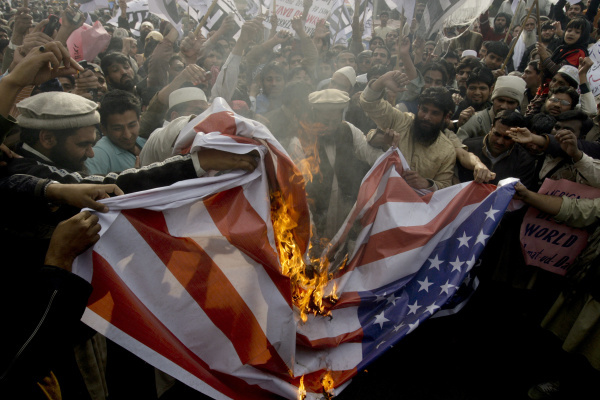 The pictures below demonstrate that Muslims are not ready to cease and desist wishing us ill.
Muslims in Pakistan protest the American Memorial of September 11. 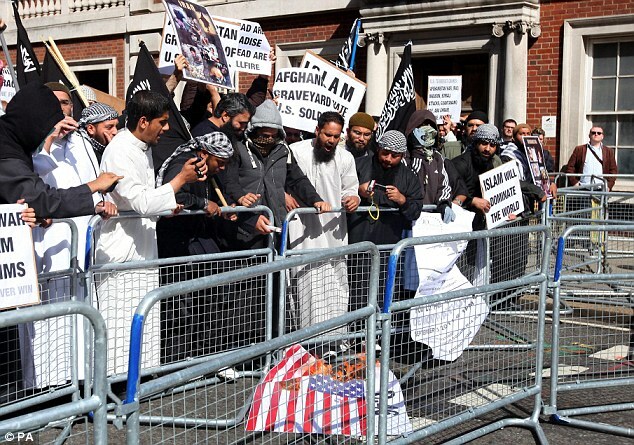 Muslims in the U.K. protest against the U.S.
observance of September 11, as a national day of mourning. After seeing these photographs, it's going to take a lot of talking and proof to convince us that the radical Islamists are "just a handful" of extremists. They are men with no scruples, and filled with an insatiable blood lust. They are religious fanatics and they are not few. Splintered though they may be they grow in numbers daily and recruit young men from all walks of life, especially in the United States. Our government has kept our country safe from attack for 10 years. Thousands of young men and women have lost their lives or been maimed by fighting abroad to keep us from having to fight here at home. But now we face a greater danger. Here in America we now face the enemy within. Amen, and amen! Too many Americans, and otherwise, refuse to see the handwriting on the wall. Excellent, and I agree TOTALLY! DITTO! RIGHT ON, RIGHT ON, RIGHT ON! And daily we see Muslims doing the complete opposite of trying to assimilate - doggedly fighting to replace OUR American laws,rights and values with their Sharia law. .... I WILL NOT SURRENDER/I WILL NOT SUBMIT.